*NOTES* Blog is formatted with newest posts first. After reading the introduction paragraph, new viewers should read from the bottom up. ~ Type "background" in the "SEARCH" box below to learn more about us. ~ Enter "E-MAIL ADDRESS..." and click "SUBMIT" to be notified of new entries. ~ Click on any photo for an enlarged view ~ Click on any highlighted item to learn more about that item. ~ If viewing on a mobile device, click on "VIEW WEB VERSION" at the bottom for a full view. INTRODUCTION: First, allow me to introduce the members of this group...I'm Mike riding my 2003 Heritage Softail Springer...my wife Juju is on her 2015 Freewheeler...and Ed and Nancy are on their 2009 Heritage Softail. For the purposes of this trip we are referring to ourselves as H.A.R.P. HARP is a made-up name and it simply stands for Hogs And Retired People...and all that means is that we are members of HOG (Harley Owners Group) and we are...you guessed it...retired! The name came about when seven of us made a trip out west, but just the four of us this time. I've done blogs before, and this one will be for the same reason...to refresh our memories in our "Golden Years" (they say the memory is the second thing to go...and I can't remember what the first thing was). What is different this time is the blog is being shared by THUNDER ROADS PENNSYLVANIA MAGAZINE...Truly, an honor. This journey will be a round trip from, and to our home town of Pittsburgh, Pennsylvania. The plan is to travel to the Atlantic coast at Ocean City, Maryland for the "Official" start on U.S. Route 50. We will follow U.S. 50 west for over 3,000 miles to its terminus in Sacramento, California. From Sacramento, we will head a bit further west to the Pacific Ocean before we begin to travel south. California Highway 1 and U.S. Route 101, better known as the Pacific Coast Highway, will be the route for about 500 miles to Santa Monica. At the world famous Santa Monica Pier, we hop on Route 66...The "Mother Road". Travelling about 2,500 miles to the north east, we'll arrive at the end of 66 in Chicago, Illinois. The "Official" end of our journey. From Chicago, it's just another 450 miles and we're back in Pittsburgh. We've made very few lodging reservations, thus eliminating the pressure of trying to get somewhere by some deadline. The whole purpose of this ride to see this country and whatever piques our interest along the way...and we will be looking for that giant ball of yarn! So we invite you to ride along with us. We hope you will find it both entertaining and informative. Please feel free to leave your comments and share this with anyone you feel would have an interest. Today's pre-dawn departure from Elk City allowed us to witness an incredible sunrise. The partly overcast skies kept it cool most of the morning, but dry in spite of some dark clouds rolling in and out. We were most assuredly out of ranch country and into farm country. Wide expanses of hay, alfalfa and freshly plowed land made it clear what business was king around here. Although, Oklahoma does have more oil and oil processing than Texas. Before I go any further, I must give kudos (BIG kudos) to Oklahoma. So far, they are the undisputed top caretakers of Route 66. The Oklahoma segment has two major assets previously unseen together...1) The road is in very good shape. 2) They have signs telling you which way to go! On our way to Oklahoma City, there were a variety of small towns. Two of which were called Canada Valley and Yukon...I wonder from where their founding fathers came! By the way, Yukon is the childhood home of Garth Brooks. Approaching OKC the skies began to blacken and it seemed a big storm was brewing in front of us. Since we had just seen Harley World, the OKC H-D dealer, we figured it would be as good a place as any to wait out the rains. The dealer had just opened when we arrived so we helped ourselves to the fresh coffee, looked around, talked to some folks and watched the weather channel in the lounge. The rain never materialized, at least where we were. But, north east of us, they got one hell of a soaking. One spot got three inches of rain in four hours. The worrisome part was that the rain was exactly where we were headed. By 10:00 a.m. it cleared enough for us to continue on. Back on 66 we began to see the things we expected to see along the "Mother Road". Not having Nancy as our photographer meant it was up to me to try to take pictures while riding. Needless to say, I missed a lot. something she wanted. I could have spent all day here, but all things must come to an end. Besides, the clouds were now gone and the sun was shining. Mississippi, that had plumbing. The porcelain two seater, now in ruins, shows what "modern convenience" was all about back in the day! 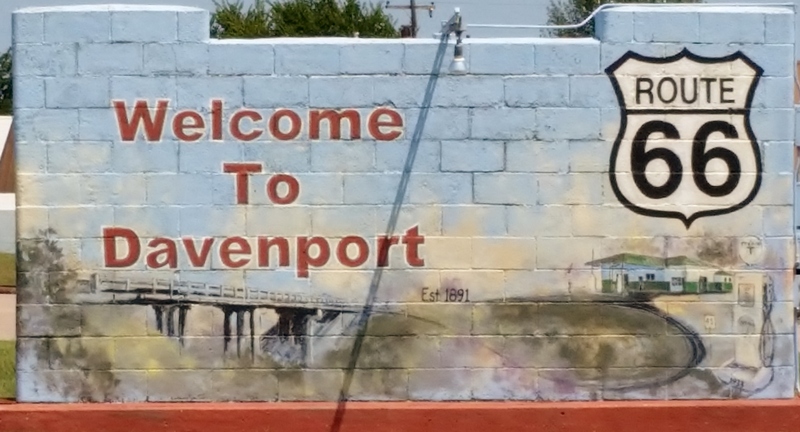 Heading toward Tulsa, we came through Davenport. Since it was now lunch time, we began looking for "one of those places" you would expect to find on Old Route 66. And darn if it wasn't there! In another former filling station, the Early Bird Cafe was in front of us as we rounded a bend. Small and decorated with very old license plates, mostly from Oklahoma, it had that "certain something". I had the Pickle-O Ranch Burger. It was adorned with ranch dressing and fried pickles. Very tasty! Motoring on down the road, we crossed into Missouri and pulled into our hotel in Joplin. Tomorrow, we'll find out if Oklahoma retains it's superior caretaker status, or if Missouri can do better.